We synthetically create new materials with exciting new properties using low-dimensional carbon materials as starting reagents. New chemistries and tools are being developed in our laboratory to directly tailor nanomaterials at the electronic and optical levels. In so doing, we have been able to open new research directions and develop technology platforms for discovering fundamentally new phenomena and properties at both the very small length scale and the very large. 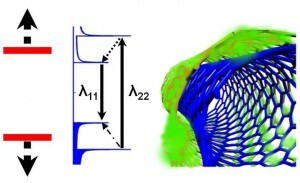 Examples of our current research include creating molecularly tunable fluorescent quantum defects to understand and control the coupling of electrons, excitons, phonons, and spin with defects in reduced dimensions, establishing the molecular science of carbon, elucidating the fundamental principles that govern the assembly and collective properties of nanostructured solids and networks, and developing novel devices, instrumentation and methodologies to tackle some of the fundamental problems in energy, nanofabrication, quantum science, nanoelectronics, and biomedicine. 1. Molecularly Tunable Fluorescent Quantum Defects. 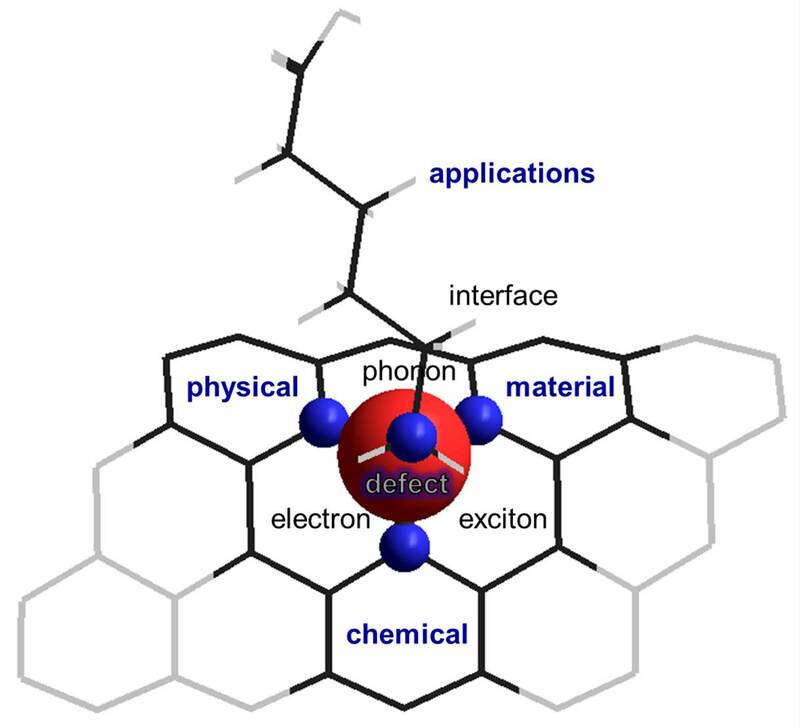 Defects can rule the properties of a crystal. 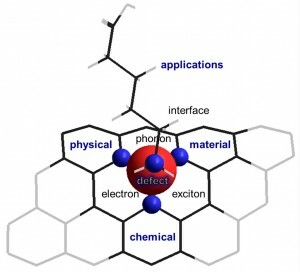 This effect is particularly intriguing in atom-thick materials, such as single-walled carbon nanotubes (SWCNTs) and graphene, where new chemistry and physics may arise due to strong coupling of electrons, excitons, phonons, and spin with defects at reduced dimensions. Our lab has synthetically created an entirely new class of defects that we call molecularly tunable fluorescent quantum defects, or quantum defects for short. We are exploring these chemically-tailored, fluorescent quantum defects as a new toolkit for materials engineering, for brightening of dark excitons, for the synthesis of quantum emitters and single photon sources, and for probing chemical events that could be otherwise difficult to capture. “Photochemical Creation of Fluorescent Quantum Defects in Carbon Nanotube Hosts.” Wu, X.; Kim, M.; Kwon, H.; Wang, Y. H.* Angew Chem. Int. Ed. 2018, 57, 648-653 (Frontispiece). “Chirality-Selective Functionalization of Semiconducting Carbon Nanotubes with a Reactivity-Switchable Molecule.” Powell, L. R.; Kim, M.; Wang, Y. H.* J. Am. Chem. Soc. 2017, 139 (36), pp 12533–12540 (Journal Cover). “Molecularly tunable fluorescent quantum defects.” Kwon, H.; Furmanchuk, A.; Kim, M.; Meany, B.; Guo, Y.; Schatz, G. C.*; Wang, Y.H. * J. Am. Chem. Soc. 2016, 138, 6878-6885. “Optical probing of local pH and temperature in complex fluids with covalently functionalized, semiconducting carbon nanotubes.” Kwon, H.‡, Kim, M.‡, Meany, B.; Piao, Y.; Powell, L. R.; Wang, Y.H.*. J. Phys. Chem. C 2015, 119, 3733–3739. “Brightening of carbon nanotube photoluminescence through the incorporation of sp3 defects.” Piao, Y. M.; Meany, B.; Powell, L. R.; Valley, N.; Kwon, H.; Schatz, G. C.; Wang, Y. H.* Nature Chemistry 2013, 5, 840-845.
overcome this materials limitation, we have synthesized a novel structure that is equivalent to a SWCNT hermetically sealed by a chemically tailored outer wall, created from double-walled carbon nanotubes through outer wall-selective covalent chemistry. This concept allows us to address a series of fundamental questions central to nanomaterials chemistry. For example, how are the electronic properties of a semiconducting nanostructure affected by its chemical environment? What if the environmental effects could be controlled or completely eliminated by protecting the inner-tube with the outer wall? Will electrical transport in such a “double wall” structure become immune to chemical perturbations by oxygen and water? Will it fluoresce brightly? “Laser lithography of a tube-in-a-tube nanostructure.” Ng, A.L. ; Piao, Y.; Wang, Y.H. * ACS Nano 2017 (ASAP). DOI: 10.1021/acsnano.7b00624. “Chemical gating of a synthetic tube-in-a-tube semiconductor.” Ng, A.L. ; Chen, C.-F.; Kwon, H.; Peng, Z.; Lee, C.S. ; Wang, Y.H. * J. Am. Chem. Soc., 2017, ASAP. “Selective breakdown of metallic pathways in double-walled carbon nanotube networks.” Ng, A. L.; Sun, Y.; Powell, L.; Sun, C.-F.; Chen, C.-F.*, Lee, C. S.; Wang, Y. H.* Small 2015, 11, 96-102 (Journal Cover). “Covalently functionalized double-walled carbon nanotubes combine high sensitivity and selectivity in the electrical detection of small molecules.” Huang, J.; Ng, A.; Piao, Y. M.; Chen, C. F.; Green, A.; Hersam, M. C.; Lee, C.; Wang, Y. H.* J. Am. Chem. Soc. 2013, 135, 2306-2312. “Optical and electrical properties of inner tubes in outer wall-selectively functionalized double-wall carbon nanotubes.” Piao, Y. M.; Chen, C. F.; Green, A. A.; Kwon, H.; Hersam, M. C.; Lee, C. S.; Schatz, G. C.; Wang, Y. H.* J. Phys. Chem. Lett. 2011, 2, 1577-1582. “Double-walled carbon nanotubes: challenges and opportunities.” Shen, C.; Brozena, A. H.; Wang Y. H.* Nanoscale 2011, 3, 503 – 518. (invited review article). “Outer wall selectively oxidized, water-soluble double-walled carbon nanotubes.” Brozena, A.H.; Moskowitz, J.♯; Shao, B.♯; Deng, S. L.; Liao, H. W.; Gaskell K. J.; Wang, Y. H.* J. Am. Chem. Soc. 2010, 132, 3932-3938. 3. Nanoelectrode Networks for Energy Storage and Harvesting. We are researching novel chemical methods and nanofabrication approaches to integrate CNTs for a wide range of basic and applied research, including lithium ion batteries and solar cells. The projects in our lab currently focus on studying electrical transport through nanotube interfaces and synthesizing heterogeneous nanostructures that may mechanically self-heal and are electrochemically reversible as the anode of lithium ion batteries. The remarkable electron accepting capabilities and charge transport properties of SWCNTs have also suggested new possibilities for overcoming the efficiency bottleneck currently facing several next-generation solar cells. CNTs can significantly improve the performance of organic photovoltaic cells and the photoconversion efficiency of TiO2-based Grätzel cells by effectively collecting and shuttling the electrons injected from light harvesting components (e.g., porphyrins) or charge separation centers (e.g., TiO2 nanoparticles). The efficient electron transport also facilitates charge separation and prevents charge recombination, which may further improve the photoconversion efficiency. “Li3PO4 matrix enables long cycle life and high energy efficiency bismuth-based battery.” Sun, C.-F.; Hu, J.K.; Wang, P.; Cheng, X.-Y. ; Lee, S. B. *; Wang, Y.H. * Nano Letters 2016 (accepted, article ASAP). “Interfacial oxygen stabilizes silicon anodes.” Sun, C.-F.; Zhu, H.-L.; Okada, M.; Gaskell, K.; Inoue, Y.; Hu, L.; Wang, Y. H.* Nano Letters 2015, 15, 703-708. “A beaded-string Silicon Anode.” Sun, C.F. ; Karki, K.; Jia, Z.; Liao, H.; Zhang, Y.; Li, T.*; Qi, Y. *; Cumings, J. *; Rubloff, G. W.; Wang, Y. H.* ACS Nano 2013, 7, 2717-2724. “Nanofabrication beyond electronics.” Wang, Y. H.*; Mirkin, C. A.; Park, S.-J. ACS Nano 2009, 3, 1049-1056 (invited perspective). 4. Ultra-selective Carbon Network Chemistry. Single-walled carbon nanotubes (SWCNTs) are a class of nanostructured materials that combine remarkable electrical, mechanical, thermal, and optical properties all in one. Unlike other nanostructures such as quantum dots, SWCNTs are (in a sense) molecular in nature. Their fascinating properties are not simply a result of size effects, but originate from an intertwining of the one-dimensional confinement of electronic states with the incredible versatility of how the carbon-carbon bonds are arranged within the tubular network. Within a small diameter range (0.4–2 nm), a SWCNT can have over 150 possible chiral structures, each uniquely indexed by a pair of integers (n,m). For two SWCNTs that differ in diameter by less than 0.01 nm (e.g., [10,10] vs. [11,9]), one has an electrical conductivity rivaling copper while the other is predicted to be a semiconductor with interesting optical properties. This dramatic change of properties with a subtle difference in structure gives rise to a vast new realm of chemistry and physics. However, all current synthetic methods for making SWCNTs yield a complex mixture of all types of nanotubes, and moreover, SWCNTs are virtually insoluble in any conventional solvent. These two problems have held back a host of potential applications and the full establishment of this new branch of molecular science, but they also have persistently challenged some of the limits of nanoscience and nanotechnology from the perspective of chemical synthesis, catalysis, complex mixture separation, metrology, and nanostructure manipulation. To meet some of these challenges, we are developing new materials strategies to eliminate the insolubility problem facing SWCNTs and new methods to effect the separation and manipulation on the single chirality level. “Optically triggered melting of DNA on individual semiconducting carbon nanotubes.” Wang, C.-Y. ; Meany, B.; Wang, Y.H. * Angew. Chem. Int. Ed., 2017, 56, 9326-9330. “Achieving ultrahigh concentrations of fluorescent single-walled carbon nanotubes using small-molecule viscosity modifiers.” Leed, J. D.; Fourkas, J. T.*; Wang, Y. H.* Small 2013, 9, 241-247. “Acyclic cucurbit[n]uril molecular clips selectively solubilize single-walled carbon nanotubes in water.” Shen, C.; Da, M.; Meany, B.; Issacs, L.*; Wang, Y. H.* J. Am. Chem. Soc. 2012, 134, 7254−7257. “Outerwall selective alkylcarboxylation and enrichment of double-walled carbon nanotubes.” Deng, S.; Piao, Y.-M.; Brozena, A. H.; Wang Y. H.* J. Mater. Chem. 2011, 21, 18568-18574. “Diameter-dependent, progressive alkylcarboxylation of single-walled carbon nanotubes.” Deng, S.; Brozena, A. H.; Zhang, Y.; Piao, Y.-M.; Wang, Y. H.* Chem. Comm. 2011, 47, 758-760. “Confined propagation of covalent chemical reactions on single-walled carbon nanotubes.” Deng, S.; Zhang, Y.; Brozena, A. H.; Mayes, M. L.; Banerjee, P.;Chiou, W. A.; Rubloff, G. W.; Schatz, G. C.; Wang Y. H.* Nature Communications 2011 2:382 doi: 10.1038/ncomms1384. 5. “Seeded Crystalization” of Nanostructures: From Discrete Nanoparticles to Organized Solids. A group of atoms are often not functional until they are made a molecule, and depending on how the atomic building blocks are bonded, their collective properties may be totally different. Will nanostructures behave similarly to atomic building blocks? The ability to assemble isolated nanostructures into ordered solids and functional networks may open a new world. This capability will also be ultimately required for the realization of many potential applications based on nanomaterials, such as nanoelectronics, quantum wires, photonic crystals, and solar cells. Unlike molecules or atoms, little is known about the fundamental principles that govern the self-assembly and directed assembly of nanostructures. We will approach this problem by making an analogy to crystallization. For example, how does self-assembly nucleate on a surface? Can one plant a “seed” to direct the subsequent assembly? Is it possible to introduce long-range order into a self-assembled system by planting a series of “seeds” that are correlated in space and symmetry? Will this bottom-up approach afford both a packing density far beyond the resolution of lithography and long-range registry that is typically missing in self-assembled systems? We like to ask impossible questions, and we are always seeking the wow moments. Stay tuned. “Superacid-Surfactant Exchange: Enabling Non-destructive Dispersion of Full-length Carbon Nanotubes in Water.” Wang, P.; Kim, M.; Peng, Z.; Sun, C.-F.; Lieberman, A.; Mok, J.; Wang, Y. H.* ACS Nano 2017, 11 (9), pp 9231–9238..